Pack it, hike it, conquer it, and get some RNR. Glen Alpine Trail which you pickup after the drive in past Fallen Leaf Lake for an 8.6 out and back moderate rated hike. The trail is beautiful and starts out on a gravel road with old structures and a spectacular waterfall just off the side of the road before hitting the single width trail for your ascent. You will not be disappointed with the granite rock croppings and fast-moving creek with mini-waterfalls of its own on the way up to Gilmore Lake. The close by moving stream also provides hikers plenty of spots to filter water and fill up those bottles and Camel Pak. Elevation gain is close to 2,000 feet and the lake sits at about 8,400 feet. Permits are required. If day hiking, you can obtain a day permit at the trailhead, also if going on a multi-day backpacking trip make sure you plan your trip and obtain permits in advance online here. A couple of miles in you will come to the trail intersection for Grass Lake and you will keep to your right to continue to climb to Gilmore Lake. As the landscape changes from open granite to a partly shaded forest setting, you will come to the trail marker for Half Moon/ Gilmore Lake. Here you will keep to the right as you notice the trail steepness increases. You will soon be met with a final ascent and this is where you will feel the burn in your legs as you push through to Gilmore, thoughts will soon run through your head about how nice it will be to just sit down and relax. Don’t stop yet, because you are closing in on that spetaculier crater bowl lake and you soon will be relaxing at camp. As the trail serpentines back and forth the last few times and seems to level out that is when you finally see the lake coming into clear view. You will find plenty of campsites all around the lake, some better than others. Depending on the time of year and days of the week you visit, you may find you are the only one there with this entire oasis all to yourself. The last trip I took to Gilmore there was only one other group camping at the lake. The fishing here was not too great on my last trip, but I have had success in the past, my favorite lures in Desolation Wilderness lakes are blue and silver Kastmasters, 1/8 or 1/4 oz. There is plenty to explore around this lake and even some day hikes you can take advantage of. If you are looking to pack out to a second lake or more on multi-day trips look at making a stop at Half Moon Lake, which you will descend to the last intersection you came to in the trail before you ascended up to Gilmore on your hike in. The trail marker is clearly marked Gilmore/ Half Moon Lake. You will have another small elevation gain into Half Moon after your descent from Gilmore, but this is an easy hop. You can read my review on Half Moon Lake here. There are several other lakes close by all a decent down from Gilmore and a small climb back up like, Aloha, Suzie, and Heather Lake. 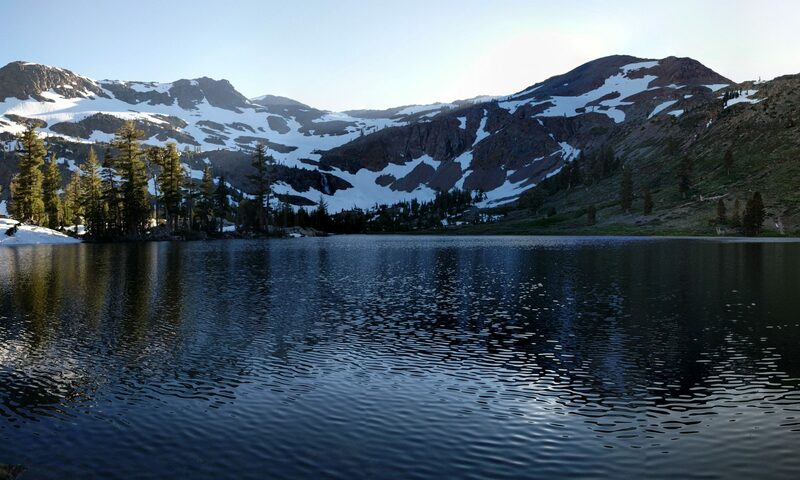 You really can’t go wrong with any of the lakes in this vicinity of Desolation Wilderness. Have a great hike and as always if you have any questions, feedback, or want to share your own experience please leave comments or contact us. Looks like a great location. Especially, because as you write there are many other lakes in the nearby area. Again, thanks for sharing with us your adventure to Gilmore lake. Lake Doxa in Greece looks breathtaking. Would be awesome to venture out there someday. Appreciate the comment. Happy hiking! Thanks for the reply and great to know you checked out lake Doxa. Happy hiking to you too. Previous PostPrevious Is stoveless the new trend?